After watching season 2 of MasterChef (a reality cooking show on FOX), I decided that I really wanted to take a chance, so I auditioned and was lucky enough to get the call to go to L.A. as a Top 100 semifinalist. I packed enough clothes to last a year, kissed my husband and kiddos goodbye, then told them that we would go to Disney if I got the winner’s check. My fellow contestants and I all checked into a hotel and started the process of interviews, shopping trips, and take after take of walking into a dusty, dirty warehouse ready to cook! After watching many of my co-contestants succeed or be sent home, and many days of wearing the same outfit (my feet will never be the same), I cooked my “Decadent Apple-Caramel Spice Cake“and headed into my destiny with the judges. I sculpted figurines of each judge out of white chocolate and fondant to go on top! Gordan Ramsey, Joe Bastianich and Graham Elliott are pretty much my age (well maybe not Graham..he’s still a young pup) so I felt like I was going to hangout with friends. But, I knew that my cake hadn’t had the proper time to cool and was looking pretty sad (actually, it looked dreadful), so I was nervous that they would hammer me on the presentation. 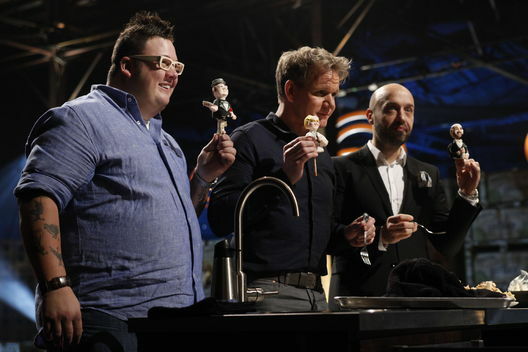 I knew that it was going to taste great, and with my sculptures of the judges, I felt I had a pretty decent chance! Thankfully, the guys had a great sense of humor about things and after many laughs and lots of bites of cake, I got all three judges to vote “yes” to giving me the coveted apron! There wasn’t a whole lot of time to bask in the moment of success because next came the hamburger challenge. Unfortunately, I was sent packing. Regardless, I was so inspired and ready to keep cooking. I had an amazing time and met some incredibly talented people that can cook like no one’s business. After going through the “what ifs” and “should haves”, I came to the conclusion that God sent me out there for a reason. While that reason wasn’t to win, the creation of Every Girl Gourmet was!